February for many people is the month when romance is in the air but for Local Government it is something quite different – it is the month when we have to set the budget for the coming year and take ever more difficult decisions about what services can be sustained and what level of council tax is right. But it will be the Council’s budget that takes up most time at the Town Hall this month. Of course we work on this all the year round but things become more intense when the Government tell us how much funding they are prepared to provide each December. It is easy when something you’ve been worrying about turns out to be less painful than expected to breathe a sigh of relief and say “Well that’s OK.” That is exactly how many people reacted to that announcement in December, but they were wrong. It’s not OK.
Council budgets have been hit harder than any other part of the public sector and while we have responded by making ‘efficiency cuts’ we have also had to make cuts that have reduced services. This year’s Settlement changed how and when the loss of Government funding happens to us, but it will still happen. The Settlement also did something quite unexpected. It told Councils to increase Council Tax! For years Government has been telling us not to increase Council Tax and created incentives to help us do this. Since 2010 Lewisham has only increased Council Tax once but now we have been told to put it up 2% to help fund Adult Social Care and the grant that we have been receiving as a result of freezing Council Tax in previous years is being taken away leaving from us, facing either a further Council Tax rise or even deeper cuts next year. Over the next few weeks we will have to resolve these dilemmas and we know that there is no easy answer. The services the council provides are important to many residents but we also know that an in increase in Council Tax will be an unpalatable choice for many of you facing rising costs in so many other ways too. On the other hand I am sure that the students of Lewisham and Southwark College will make sure that the Valentine’s Dinner is extremely palatable! As the old year drew to a close it became clear that the Government’s Austerity approach will continue to challenge the ability of Councils to meet the needs of the communities we serve. There may have been a few tweaks to the Local Government settlement which mean that screw gets turned slightly more slowly but the same level of cuts will still be required. 2016 will be a year when we have to make near impossible choices between spending on care of the elderly and the provision of Libraries, between services for vulnerable young people and filling in potholes. And there can be no right answer. We will strive to get the most out of every pound we still have but also work ever more closely with our local residents so together we sustain the things they care about. I hope that 2016 will see a downturn in the level of youth violence which still happens too often in Lewisham and across London and we will work closely with the Metropolitan Police on this. We are already planning on integrating what we do even more closely with our local NHS so that we are able to get the best for everyone from the limited resources available to us. Even more new homes were built last year than planned and that needs to happen again but we also need to get a London Mayor elected who will prioritise Housing so I will be working hard to get Sadiq Khan into City Hall next May. Happy New Year to all SLP readers and let’s hope Millwall can squeeze into the playoffs too. The Holiday season is a time when we both look back over the year past and forward to the New Year and what it might bring. 2015 was a year that many of us will look back on with mixed feelings. Local Government and the services it provides have continued to be put under enormous strain as the Government has pushed its austerity programme harder and deeper. But we have seen public servants working long hours to make sure that essential services continue and our residents doing more and more to help their fellow citizens whether helping at a Community Library, setting up Food Banks or running one of the hundreds of community Groups we have in Lewisham. The General Election promised the possibility of change but ended in defeat for my Party. That defeat was particularly difficult to swallow in Lewisham where Labour won strongly. We said farewell to Dame Joan Ruddock after 28 years serving Deptford and welcomed Vicky Foxcroft as her replacement. Along with Jim Dowd and Heidi Alexander she also served as a Local Councillor and it is reassuring to know that when ministers who haven’t had that experience say some of the things they do we have three MPs who can point out their errors. It has been particularly good to see Heidi being such a powerful advocate for the beleaguered NHS in her new role as Shadow Health Secretary. London’s Housing Crisis has deepened during the year but in Lewisham we have stepped up our efforts to increase the number of new homes that are being built including building some ourselves. Last year there was a net increase in Lewisham of 1,468 homes and over 300 long term vacant properties were brought back into use. This was 33% above the figures in the London plan. Lewisham and every borough in London will need to match this performance year after year if we are to start turning the crisis round. 2016 will see London elect a new Mayor and I very much hope it will be my good friend Sadiq Khan who has made clear that addressing that Housing Crisis will be his top priority. The Christmas holiday season can be a time of joy for some but for others it can be a sad and lonely time. And for some it will be just another working day helping to keep our city running. However you will be spending it may I take this opportunity to wish you, your family and friends a safe and happy new year. Our Report (1) was intended to inform the way Councils responded to the inevitable cuts in public spending which were coming after the 2010 General Election. We concluded that it was possible to make savings yet still offer a significant degree of protection to front line services. We couldn’t have known then that Local Government would be singled out to bear a significantly higher proportion of cuts or that those cuts would be weighted to hit areas with the greatest need, hardest. But in the years that followed Councils up and down the country did manage to make huge reductions in spending without destroying services. Local Government staff played their part too – thousands left our employment and there was a three year pay freeze followed by below inflation pay increases. Looking back at what my own council, the London Borough of Lewisham, did we see a reduction in spend between 2010 and 2014 of £97m but more than half of this was achieved by greater efficiency and taking money out of the “back office”. There were noticeable cuts in services of course but these were within the range of provision about which local variation is to be expected – of course for Labour Councils this inevitably meant moving towards levels of provision that previously only Conservative Councils considered acceptable. However the budget that we set in Lewisham recently took us close to the point where we will move beyond legitimate debate about what is right for a given area and into the closure of services vital to the well-being of our communities. We would have passed that point already if we had not fallen back on the use of New Homes Bonus funding and a drawing on reserves which will need to be made good in a year’s time. What lies ahead on current projections is a crunch at some point in the next 24 months when most councils will see their ability to make choices about the level at which many services are delivered simply disappear as the inexorable pressure of social care costs drives out any remaining discretion. It is easy to rant about how unfair it is that Labour run urban areas have been asked to make deeper cuts – I know it is because I do it myself – but that anger cannot be allowed to obscure two things that have been glossed over again and again yet point towards impending disaster for many local communities. The second thing that is glossed over or even deliberately used by ministers to confuse matters is the difference in the scale of costs between different services. The General Fund has to cover Social Care as well as Youth Work, Libraries, Parks, Crime Reduction, Refuse Collection, Street Sweeping among other things. In the year 2014/15 Lewisham’s General Fund was £268m – Adult and Children’s Social Care accounted for almost half of that. Over the next three years on current projections we need to take out a further £85m of spend. Ministers don’t talk about the cuts they have forced on Social Care only about the protection they have offered the NHS. But the two are inextricably linked and cuts to Social Care go a long way to explaining why the NHS experienced a crisis this winter. Labour Councils have done their best to weight cuts away from Social Care but when it represents such a large part of the spend that can actually be controlled it is impossible to protect it from cuts. My co-chair Richard Leese and his colleagues are about to try and solve this dilemma in Greater Manchester by bringing Social Care and the NHS budgets together and reconfiguring the way services are delivered. That reconfiguration will have be quite radical and I wish them well as they set about it – the way that Acute Hospital services have dominated our thinking about how we deliver health for our communities needs to change and there should be more chance of taking communities with us when this is led locally rather than imposed from Whitehall. If we accept that Social Care cannot be subject to pro-rata cuts (and in London we have a rapidly rising population which is actually increasing demand) those other services funded through the General Revenue Fund will face disproportionate cuts. The services I listed earlier vary in cost in Lewisham between Leisure at £2.5m and Refuse Collection at £10.9M. Taking say 40% from some will render them unviable but if any are protected it will tip others over to the point where they cease to exist in any meaningful way. Some of these services have a very low threshold of statutory provision and this makes them particularly vulnerable. Other are likely to prompt local opposition on a scale which is at odds with the actual amount spent on them – ask anyone who has tried to save money by closing a library! By 2018 once those things that the Council must do are taken into account Lewisham could have as little as £10m to fund Youth Work, Libraries, Parks, Crime Reduction and other non-statutory services. Other councils may reach this point even sooner. We know that an incoming Labour Government intends to address the unfair way resources are distributed and we welcome that but by itself it will not resolve the problem. That Commission recently published its final report which attempted to set out practical alternatives which could allow Local Government to avert disaster. Earlier the London Finance Commission (5) looked at London in particular and made the case that the city’s current success would be put at risk if investment in the services that city needed were cut back. They called for the devolution of not only powers to deliver services and projects but also for Fiscal devolution with the city taking responsibility for some existing taxes within its area and having the power to levy new ones. The Local Government Association’s own “First 100 Days” programme (6) sets out an offer to the new government which not only gives them the opportunity to devolve to local councils and groups of councils but also show how some of the biggest challenges that government will face can actually be addressed by giving Local Government the room to act. What these reports clearly demonstrate is that Local Government and those who understand it are not simply demanding the more money be made available. They are offering a wide range of ideas and suggestions about how an entirely different relationship can be forged which finally gives localities and regions the scope to innovate and deliver services in ways which both improve outcomes and deliver better value for money. It is essential that the new government acts on this. Devolution is critical and can by enabling approaches that involve earlier interventions and better outcomes make a real difference but if Local Authorities reach the point of being financially unsustainable that opportunity could be lost. Between 2010/11 and 2014/15 in real terms spending on Defence was cut by 7%. Over the same period spending on Local Government was cut by 26.6% according to figures published by the Institute for Financial Studies. When and if that review called for by the ICoLGF takes place perhaps it too should take heed of our allies and adopt the approach taken in Germany to the fiscal relationship between local and central government where the system of taxes guarantees states and municipalities the income from certain taxes and a specified share of others. This would at least ensure that Local Government was not singled out in the way it has been since 2010. There will be many other things that the Review will need to take into account not least the absurdity that exists in some service areas of where financial and regulatory responsibilities are split between government departments. It is DCLG which controls the funding stream from which spend on Libraries comes but the Department for Culture, Media and Sport that sets policy and has the power to intervene if it thinks a Council is providing an inadequate service. This has to brought to an end – every area of responsibility needs to be examined and either the function transferred to DCLG or the service funded by directly by the Department which has responsibility for it. But in the end it will be what happens to Social Care funding that determines whether Local Government can survive and it is this that the new government will need to address with the greatest urgency. If Social Care continues to be inadequately funded not only will those other local government services that come from the same funding pot be threatened but so too will the NHS. Integration offers a huge opportunity but unprotected Social Care budgets will place unsustainable pressure on NHS budgets and destroy the opportunity that now exists to transform the NHS in the “Health Service” Bevan always intended it to be rather than the “Illness Service” it has become. After 5 years of bluster and obfuscation by the present Secretary of State for Communities and Local Government the time has come for an honest appraisal of the damage done, not because Local Government deserves special treatment but because continuing on the current path will damage families, communities and even threaten the future of the NHS itself. We must fervently hope that the next Secretary of State at DCLG finds a copy of the report of the ICoLGF waiting on their desk and acts swiftly to implement its recommendations. If he or she wants any assistance doing so I am sure Sir Richard and I would be willing to help out once more! Sir Steve Bullock is the directly elected Mayor of Lewisham and a Deputy Leader of the LGA Labour Group. (3) Local Government Finance is notoriously complex and what is described is a simplified version but the caveats would have a negligible impact on the overall scale of the problem. Today, the 27th January 2015, is the start of the 100 day countdown until the General Election. The act of voting is one of the fundamental ways that we as citizens can affect the direction our country takes, both locally and, as we will see on the 7th May, nationally as well. A good turnout at the General Election will give us a much better understanding of the depth of feeling among the population about how they want their country to be run, but a low turnout will deliver a result which may not truly reflect the will of the nation at large. It is, of course, entirely possible that some of you feel that there is simply no one standing that you are prepared to vote for. I am sometime told that on the doorstep and my usual response is to ask for an assurance that they won’t complain about anything the person who is elected does! It is in the end though a personal choice. I am much more concerned when I know there are thousands of people out there that may want to vote but have missed the opportunity through no fault of their own purely because the system of voter registration has changed. Previously, one person in every household was responsible for registering everyone else who lives at that address. Under the new individual electoral registration (IRS) method, each person is now required to register to vote individually, rather than by household. This new system of registration means that on the 1st December 2016, electors will be deleted from the electoral register if they haven’t been automatically matched using government data, or if they do not respond to requests for them to register individually. In my own borough of Lewisham we have identified that there are approximately 24,500 unconfirmed local government electors on our register, who, if they remain unconfirmed, will eventually be removed from the register on 1st December 2016. Political commentators are currently saying that the General Election is too close to call, and this makes it even more important that everyone who is eligible to vote is actually registered to vote, because every vote really does count. Lewisham Council awarded Doreen Lawrence the Freedom of the Borough in a ceremony tonight. The text of the speech I gave in her honor is copied below. Baroness, High Commissioner, Freemen and Freewomen, Members of Parliament, Councillors, Ladies and Gentlemen. The Borough of Lewisham awards the Freedom of the Borough sparingly – but when it is awarded it is to remarkable people. People like Sybil Phoenix, Terry Waite and Erica Pienaar who are all with us tonight – and, of course, Archbishop Desmond Tutu who is not but who keeps Lewisham and its citizens in his thoughts and prayers. Tonight we add a truly remarkable woman to that list and it is my privilege to begin our tributes to her. Tonight is about celebrating the achievements of the Baroness Lawrence of Clarendon as she is now called although I trust she will permit me to go on calling her Doreen. The events that have shaped her life are part of her story of course just as the continuing revelations about the appalling behaviour of some members of the police force cannot be far from our minds – but tonight is about Doreen – someone who is admired by millions and is a source of inspiration for both young and old from every walk of life. For first the first 40 years of her life Doreen’s story is one that many will recognise and share. Though born elsewhere, Jamaica, in Doreen’s case, Lewisham became home and she went to school here and later to GoldsmithsCollege. She married, started a family and brought up her children. And then one night in 1993 her life changed for ever. When tragedy strikes even the strongest struggle to make sense of it and move forward – the best that can be hoped for is that time may provide some respite as they struggle to make sense of things. Some set out to find an explanation for the tragedy, to seek justice when that is called for. Others look for a way to turn that tragedy on its head and create something of lasting value. Both of those responses require courage of an exceptional order. To set out to do both – and to come even close to success – is something that only a very few could ever achieve – but that is exactly what Doreen Lawrence has done. Most certainly no coward soul – with courage and dignity Doreen has pursued justice for her son and created the Stephen Lawrence Trust which provides such wonderful opportunities for today’s young people. Doreen is passionate about young people and this shines through every time you visit the centre but perhaps never more so than on that extraordinary morning when she ran with the Olympic torch and passed it on to our young mayor. We are proud that Lewisham is home to the Stephen Lawrence Centre and proud that Doreen has accepted the Freedom of the Borough. It is the highest honour we can bestow and she joins a distinguished group of people who have all changed not only our borough but the wider world for the better. Doreen’s elevation to the House of Lords means that there is now someone in Parliament who can speak out on the great issues of our time with a hard won authenticity that can only come from having faced all that the world can throw at them yet still being able to respond time after time with renewed passion and strength. Let me conclude with a personal thank you to Doreen – your strength, your courage, your resilience serves as a beacon to all of us in public life – sometimes we may feel things are becoming difficult to cope with and wonder why we continue – you inspire us by your example and demonstrate to us on a daily basis the pettiness of our complaints. You have faced things we cannot imagine and come through to achieve so much. 82% of Londoners believe we are in the midst of a Housing Crisis and with prices and rents rising and the backlog of homes need getting bigger each year action is needed. One of the things London Councils including Lewisham are doing is building new homes themselves. Yesterday, I handed over a site where the first six new homes will be built. It is a run down garage site which has been a long term problem. Building new homes on it solves that problem as well as providing accommodation for six families at genuinely affordable rents. These six are the first of 250 new homes the Council will deliver by 2017. We’re able to do this thanks to reforms which began under John Healey, the last Labour Housing Minister. By building them directly, we’re able to deliver the larger family homes that are most needed by those on the housing waiting list. I hope the Council will be able to build many more new homes than 250. If I am re-elected in May I will be focused on building more homes, tackling rogue landlords and rip off letting agents, and creating jobs and apprenticeships in the building industry. This will be done despite the policies of a Tory-led Government and Tory Mayor of London. Polling from London Councils has revealed that 82% of Londoners think we are in the midst of a housing crisis. How to tackle the problem is a key issue for every local authority in London. Government simply isn’t doing enough. House building is at the lowest level since 1924 and rents in London are increasing by around 10% a year. I have consistently argued that the simplest way of increasing housing supply is to remove the artificial borrowing cap on local authorities. 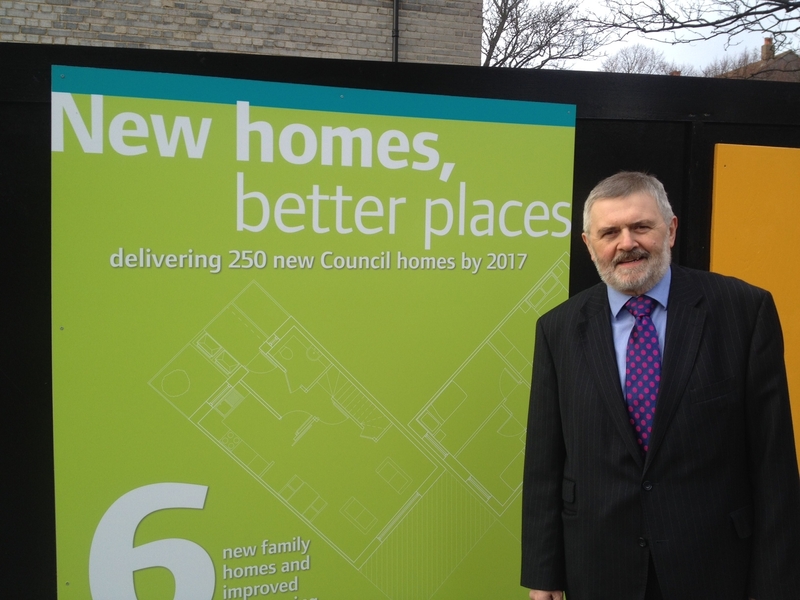 Councils across the county have taken advantage of changes which began under the last Labour government, which gave them extra capacity to build more homes. But we want to build more. If London boroughs were able to borrow against their existing assets, this could, by 2021, release funds for an extra 14,000 homes in the Capital. In Lewisham we have committed to building a minimum of 250 new council homes in the next five years and are already taking action to improve the private rented sector. If re-elected, housing will remain one of my main priorities. It’s essential that we tackle this crisis now before it is too late. Yesterday’s local government settlement confirmed the funding Lewisham Council will receive over the next two years. We will see an additional £30m cut in our ‘spending power’ by 2016. This cut does not come as a surprise. We are preparing to find savings of more than £85m over the next four years, on top of the £86m we have already been forced to make. However, this pain isn’t been felt in every council in the country. David Cameron’s county council, Oxfordshire, will see its funding increase by £2.23m. Cheshire East, George Osborne’s local council, will see a rise of £2.64m. 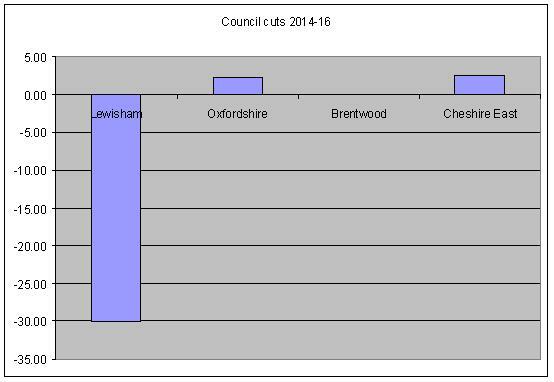 And Brentwood council, in Local Government Secretary Eric Pickles’ constituency, receives an increase of £0.1m. The increases to these three local councils are relatively small. But they are hugely significant when compared to the cuts we’re facing here in Lewisham. Government Ministers are deliberately cutting funding in poorer areas right across the country whilst protecting councils in their own back yards. It is deeply unfair and means that their constituents are being protected from the worst of their austerity measures. The next stage of the Council’s house building programme was agreed at last week’s Mayor and Cabinet. The latest plans are for the development of a further 94 new council homes on six identified plots of underused council land in New Cross, Blackheath and Forest Hill. These will contribute to the target of 250 new homes to be built by 2017 agreed earlier this year. I am hopeful that we will be able to build many more than 250 – we have identified enough land to build almost 600 – but we will need to make the finances work. In the Autumn Statement, the Chancellor announced that he will raise the local government housing borrowing cap by £300m, something which I have argued for regularly over the last few years. I will ensure that Lewisham are able to access a share of this additional borrowing allowing us to deliver more homes. To maximise the number of homes we can build, we are also considering building homes that could be sold on the open market. We would use the profits to cross-subside the development of many more genuinely affordable homes. The figures to support this are quite dramatic. For example, a programme for the construction of 300 homes for social rent would cost the same as a programme for the construction of 370 social rented homes and 90 homes for private sale, giving a total 460 desperately needed new homes in Lewisham. We will need to look at this in more detail but I am hopeful it will lead to a much larger development programme. We will break ground on the first new council homes in the new year and I am looking forward to visiting the site as they are built. Because we are building them ourselves we are able use local contractors who pay the living wage and employ apprentices, ensuring the benefits of the development remain local. As I have said before, London is in the midst of a housing crisis. The homes we are building are just a small element of what we need to do to solve the problem. We must continue to work alongside private developers and housing associations to build homes for sale and rent in increasing numbers. The Mayor of London last week set a target to build 42,000 new homes a year for the next decade. We currently build around 20,000 homes a year in London and doubling this number will be a huge challenge. But the 42,000 figure should be seen as a minimum – London Councils estimate we need many more than that to meet London’s growing housing need.